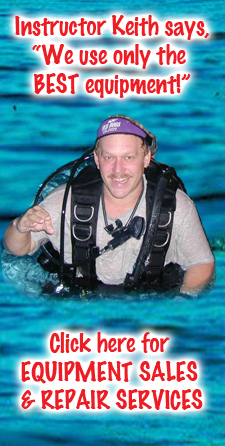 Scuba diving (scuba originally being an acronym for Self Contained Underwater Breathing Apparatus, although now widely considered a word in its own right) is a form of underwater diving in which a diver uses a scuba set to breathe underwater for recreation, commercial or industrial reasons. Unlike early diving, which relied exclusively on air pumped from the surface, scuba divers carry their own source of breathing gas (usually compressed air), allowing them greater freedom than with an air line. 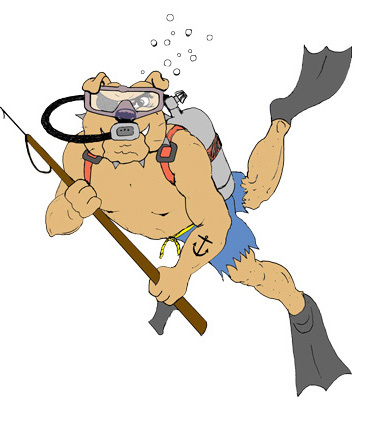 Both surface supplied and scuba diving allow divers to stay underwater significantly longer than with breath-holding techniques as used in snorkelling and free-diving. Dependant on the purpose of the dive, a diver usually moves underwater by the use of fins attached to the feet, although external propulsion can come from the use of an underwater vehicle or using a sled pulled from the surface. Scuba diving is heavily reliant on technology to be successful, and the first development of the idea of scuba was developed by Alexander Lodygin many years before the term appeared. The first commercially successful scuba sets were the Aqualung open-circuit units developed by Emile Gagnan and Jacques-Yves Cousteau, in which compressed gas (usually air) is inhaled from a tank and then exhaled into the water, and the descendants of these systems are still the most popular units today.